I received this book as an Advance Reader Copy from Cambridge University Press via NetGalley. I have studied a bit of Shakespeare, dating back to college and even more recently as my reading of The Year of Lear with a look at the historical context of Shakespeare’s work in 1606. 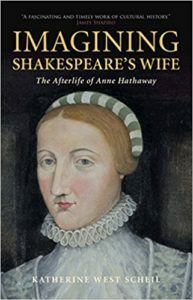 But I had not read much about Shakespeare’s family life, particularly his wife Anne Hathaway, and so this title – Imagining Shakespeare’s Wife – immediately caught my interest. The text starts out by establishing a set of expectations which I quite appreciated. Too many histories overextend themselves or pretend to know more facts than there are facts to be had. This book does not make that mistake. We learn promptly in the Preface that very little is known of Anne Hathaway, and Scheil makes it clear what is fact and what is the result of imaginings by authors and historians over the centuries. Anne Hathaway is more than a wife; she is a myth and a legend built up researchers and artists desirous of answers: “the material circumstances of history…affect the later reconstruction of lives” (pg. xi). Imagining Shakespeare’s Wife is a critique of nearly all prior attempts by contemporaries, historians, writers, tourists, and fans to personify a woman that we simply cannot know on a deeper level. Scheil does an excellent job presenting the facts we know about Anne Hathaway and then casting light on how she came to be characterized. There is careful intent to ensure the facts are kept separate from speculation with qualifiers such as “maybe,” “possibly,” “likely,” and “could have”. While this felt disruptive at first, the story Scheil pieces together quickly begins to merit this language. Scheil makes it clear that Anne’s history has been used and revised by others to support their own Shakespearean agendas. This revisionist history is unsettling. Over the centuries, writers have reframed Anne’s life in a way to legitimize their own views. As the focus on Shakespeare changed with societies, cultures, and generations, the way writers sought to portray him changed as well. And with few available facts, Anne was conjured as a plot device: the more we “know” Anne, the more we can know William. Tales of their courtship were made up, right down to the furniture. In some cases, Anne is shown as a dedicated wife and mother demonstrating his ties to the region and his superior morality. In others, she is simply left out to support a view of Shakespeare as a womanizer and the ultimate romantic. None of this can be substantiated. Scheil does an excellent job showing in depth, different versions of Anne, right down to investigations of forged items. This review of her various histories (and her sometimes intentional exclusion) was fascinating. That a real person can be misrepresented or omitted to fit the fancy of others is staggering. Anne has been quite sorely misused over time. Her own descendents used her as a means of income, notoriety, and tourism by presenting tours of her childhood home and telling elaborate tales about Anne and William’s courtship. While these stories and their props are largely falsified or speculative, tourists and researchers chose to go along with them in search of stories that support their beliefs in the Immortal Bard. Scheil states: “The central argument of this book is that the afterlife of Anne Hathaway is connected more so with developments in literary criticism, in literary forms and in ideological aims over the last three centuries, rather than with the accumulation of newly discovered factual evidence that eventually coalesce into a fully-formed, definitive result.” (pg. xv, Preface). Scheil strongly proves this thesis throughout the text. She walks us through centuries of changing tides in European and American focus and culture, showing us how the Anne’s portrayals mirror changing tides. As women’s suffrage movements took storm, Anne was seen as a strong person and cornerstone for Shakespeare’s success. In women’s clubs, Anne and Will’s relationship is played up as a romance. Post WWII, domestic housewives take center stage and Anne becomes a faithful wife, mother, and housekeeper while Shakespeare earns a living. Numerous biographies written take liberties with Anne’s story (or what little we have of it). Many of these biographies break the code between reader and biographer. Readers place a level of trust in a biographer that the information presented is well-researched and factual. When a biographer includes impressions or fantasies as facts, they are breaking a code of conduct and are in a powerful position to mislead our understanding of topics. A direct target of Scheil’s is Stephen Greenblatt’s Will in the World in which he invents stories to form Shakespeare’s relationships and personality. Many of Greenblatt’s claims lack evidence; Scheil calls this his “problematic overuse of fiction”. Scheil is not the only critic for this text; many question the book’s lack of facts, its finite language (as opposed to open ended wording), and its inability to explore other possibilities. That this is a problem not unique to Greenblatt makes the question of Shakespeare scholarship quite troublesome to me. Stylistically, the book reads a bit like a dissertation rather that a standard non-fiction text. Scheil often begins sections by stating what a chapter will present and ends sections with repetitive summaries. The style may be jarring to some; I found it familiar (I’ve written my share of research papers) but tedious at times. I thought that this book was fantastic and recommend it as a valuable asset to any scholar as well as more general readers with some prior exposure or interest in Shakespeare’s life and works. What you will not find is a fictionalized account of a woman who, unfortunately, we will never truly be able to know. But we can certainly imagine her.